The fifth edition of the Perini Navi Cup begins today, 28 August, and runs until 31 August, welcoming 15 sailing superyachts for three days of racing in the waters off of Italy's La Maddalena Archipelago. 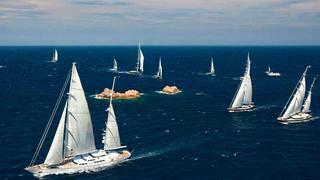 The regatta is organised by the Italian yacht builder Perini Navi in collaboration with Yacht Club Costa Smeralda in Porto Cervo, Sardinia, Italy. Sailing yachts that have confirmed their attendance include first-time participant and World Superyacht Award-winner 38m P2, previous cup winner the famed 88m Perini Maltese Falcon and Perini Navi's most-recent creation in its new 60m series Seahawk. The high-performance yachts will be matched with sailing talent, including veteran America's Cup sailor Dawn Riley aboard 50m Silencio and Volvo Ocean Race sailors Justin Clougher and Mike Toppa aboard 56m Zenji. The fleet arrives today in time for the captain's briefing and welcome cocktail party at YCCS, then racing begins tomorrow 29 August.